Since I moved here to Calca, I have been eyeing some zig-zag trails on the mountain across the Rio Vilcanota. I was told that they go up to an Inca ruin site called Huchuy Qosco (which means “Little Cusco”). That trail kept calling to me, but I was pretty intimidated. A check on Google Earth showed that there was an altitude gain of over 2800 feet in less than three miles! Steep indeed. Some friends had made the hike by starting higher up near Chinchero and hiking gradually down to the site and then taking the zig-zag trails down to the little town of Lamay. But getting to that trailhead was a bit involved. There are also routes from near the city of Cusco, but those take two days and I was not prepared to carry enough gear to camp overnight and was too cheap to hire a guide and horses like most people do. So, my only option was to go up those zig-zags and back down again the same way. With only about a week and a half left in Peru, I had to do it now or not at all. 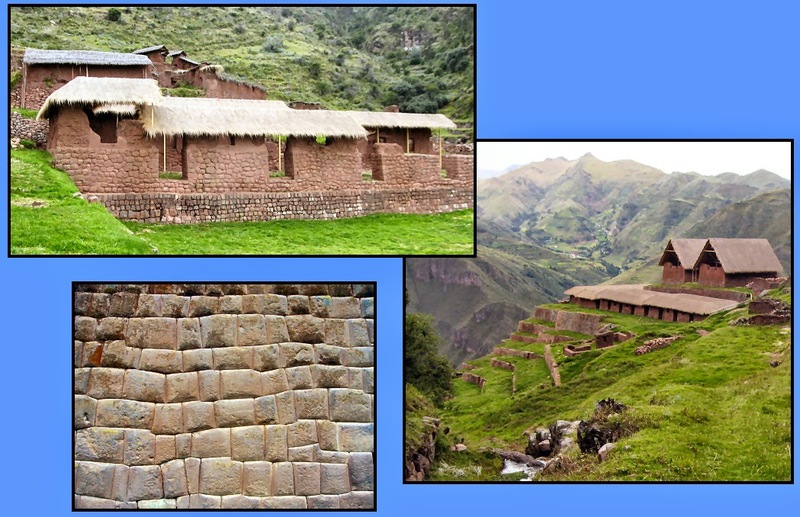 To be perfectly honest, I am not strongly drawn to ruins in the Sacred Valley—I know, I know, it sounds sacrilegious. I am more interested in the present culture and the people who live here now. (And the textiles…oh, and the food.) I also enjoy walking along less-traveled dirt roads through the small communities, occasionally meeting folks in the fields and talking with them. Sometimes I am offered chicha to drink (a homemade corn beer), or invited to come back for a meal later. 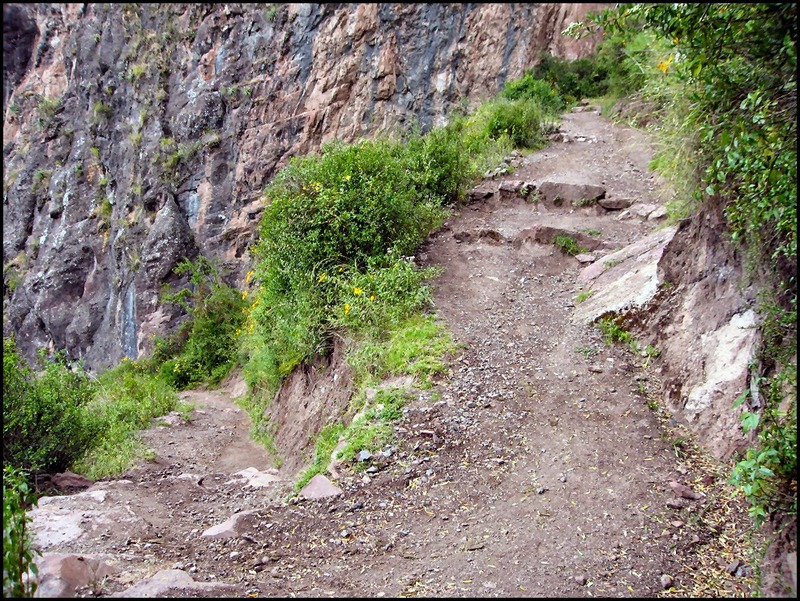 So, this hike to Huchuy Qosco was more of a personal challenge. The day before I embarked, I gave myself permission to turn around and come back if, at any time I decided it was too much for me. This is one advantage of hiking alone. The other being, that I can travel as slowly as I want to—and boy, do I travel slowly. On Thursday morning, I got up early and took a bus to the little town of Lamay, east of Calca. They let me off right at the road that goes over the bridge that begins the trail. The trail begins across the bridge. 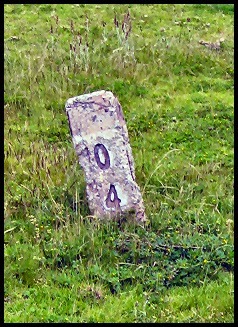 The arrow points to my destination. Right away I started going up, and before I knew it, the trail got so steep that I was stopping to catch my breath every 20 steps—sometimes in only 5 or 10 steps. Remember, the trail started at 9600 feet. Chewing coca leaves helped and I made myself stop to refuel with snacks and Powerade every hour. It took me four hours to get to the top—it takes the average person three. I met a guide coming down with a tourist couple and he asked where my group was. I told him I was solita(alone) and he gaped at me. I jokingly told him, in my broken Spanish, that I was such a slow hiker that no one would walk with me—which is actually not true—but he laughed and continued on. 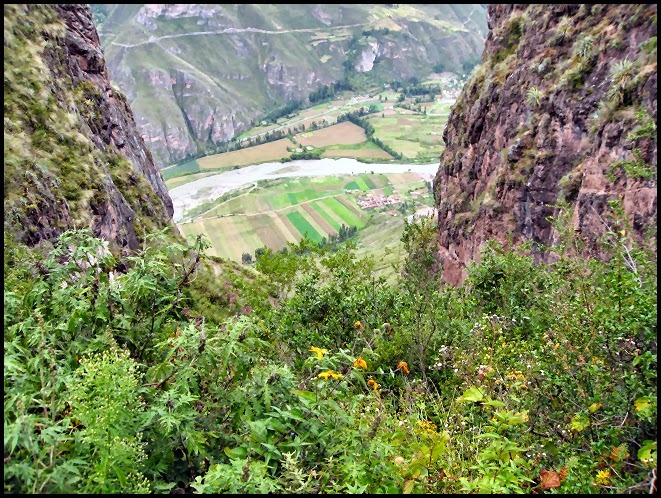 It was not long before this lovely view of this part of the Sacred Valley opened up. I also stopped to talk with a caballero (horseman) who was talking on his cell phone (!) and leading horses down with tourists’ packs on them. [That is the WAY to hike here if you are going to be out for overnight, and Rebecca (my daughter) and I did hike with pack horses and caballeros when we did the Choquequirao trail last year. Talk about luxury camping—they even prepared all our meals! See my blog post about that trip here.] The caballero was named Domingo and he wore a colorful chullo (hat) and vest, on which I commented, telling him that I was interested in textiles, especially spinning and knitting. He told me that he and his wife have a homestay house in the community of Patabamba, not far from here, where they demonstrate fiber art. He invited me to come up to visit with them next Monday. He asked me what I like to eat and we made arrangements and continued on our way. find another one waiting for me. One highlight of the trip was sighting two Andean condors in the wild. The caretaker at Huchuy Qosco later pointed out where they were nesting. 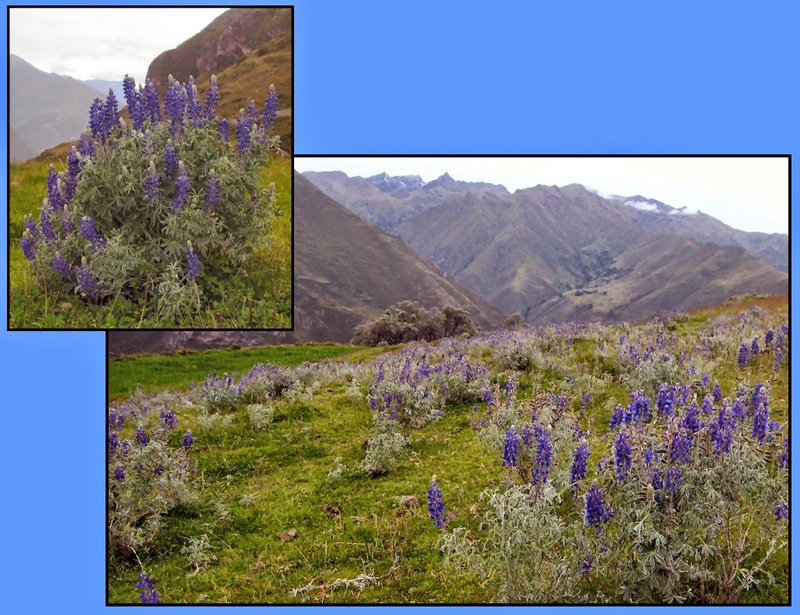 I was also impressed with the fields of blue lupine-type flowers. They reminded me of the bluebonnet carpets in Texas. 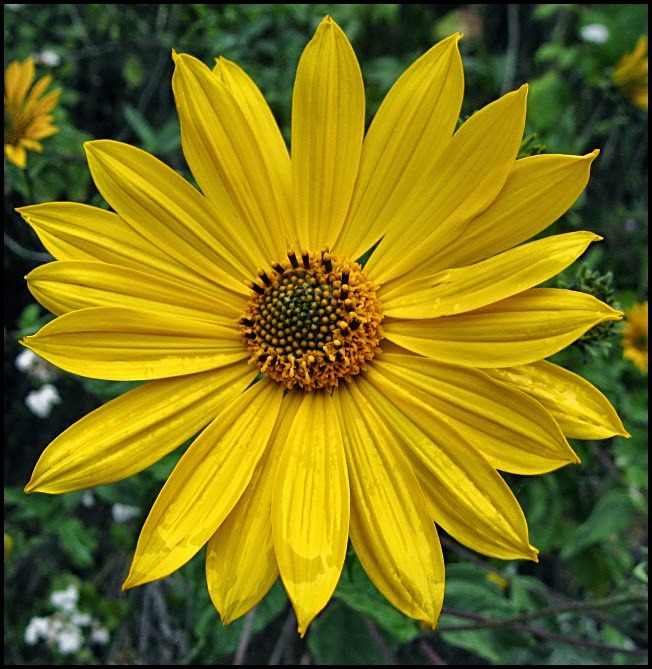 Wildflowers are blooming in earnest now, in the middle of autumn. That is because the rainy season has just about concluded with summer’s end and everything is very green. The caretaker at Huchuy Qosco told me that in a couple months everything will be brown. 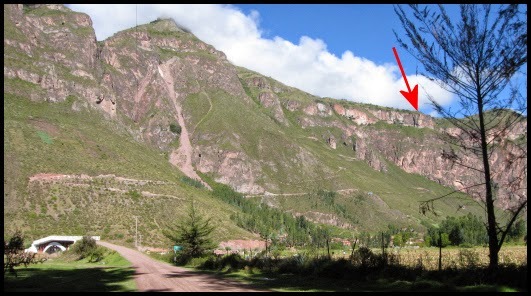 I arrived, worn out, at the ruins and then had to climb up seven agricultural terraces—each with 14 high steps! But no one was there and I found a nice grassy spot to rest for a while before exploring. It was so lovely and the solitude was welcome, even if dark clouds were gathering, threatening rain. After eating—yet again—I began to explore. These ruins have been restored (and many are covered with thatch roofs to protect the restoration, so it is easy to see how they once looked. The Inca stonework is amazing—all the stones are carved so they fit together so tightly that you cannot insert a razor blade between them. The nice caretaker gave me a short guided tour. I could have rambled for a couple hours, but since I needed to get back to the river before dark, it was time to go down. Thank goodness for trekking poles—they saved me from several nasty falls since the trail was so gravelly and it was easy to slip. Every time I fell, I just used it as an excuse to sit down and rest a bit. This part of the hike went faster—although I was still walking slowly and taking care of my knees, I did not have to stop every 10 to 20 steps to catch my breath. The air became considerably warmer as I descended.